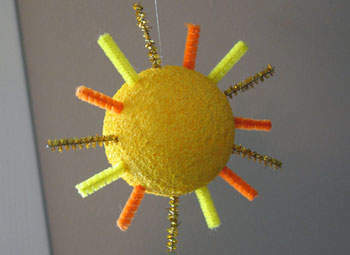 This bright foam sun decoration will look like it’s floating in the sky when suspended from your bedroom ceiling. It’s so easy to do! Place the foam ball onto something that can keep it stationary. We used a lid from a plastic milk jug. Paint the ball with a generous amount of yellow paint and let dry. Cut the chenille stems into 3” pieces and insert into the ball, alternating colors as you go, about ½ inch apart. Insert the yellow and orange stems a little deeper than the gold so that the gold appear as longer sun rays. When finished, remove one of the gold stems and tie a piece of fishing line around the stem. Place a dot of glue into the hole that you removed the stem from then insert the gold chenille stem back into the hole. Suspend the sun from the ceiling by using a thumbtack.